Yesterday I shared Part 1 of our kitchen reveal. If you missed it you can click here. Thank you to everybody who stopped by to visit and left comments! 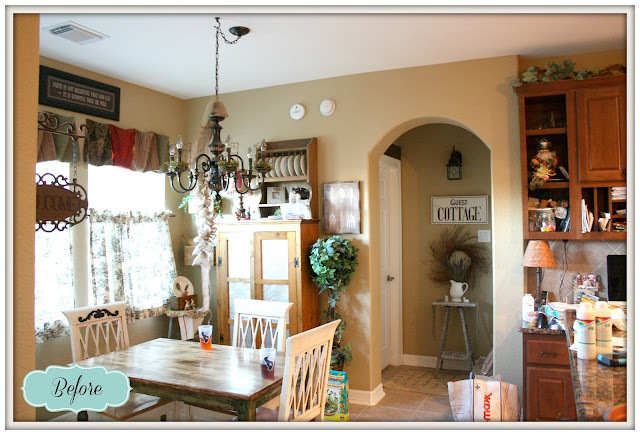 Today I will be sharing our breakfast area and where you can find me blogging away. Though there were no major changes in this area it was the little changes that made such a large impact from changing the paint color to switching out/adding accessories. 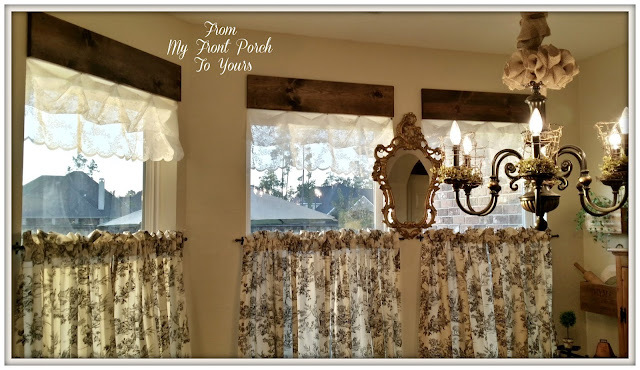 I was planning on changing out the cafe curtains to buffalo check ones but I decided that I really preferred the toile ones I already had up. I did however change out the toppers. You can not see them here because the light from outside was so bright. Here is a picture I took with my phone one morning trying to get you a glimpse of the lace curtain toppers. 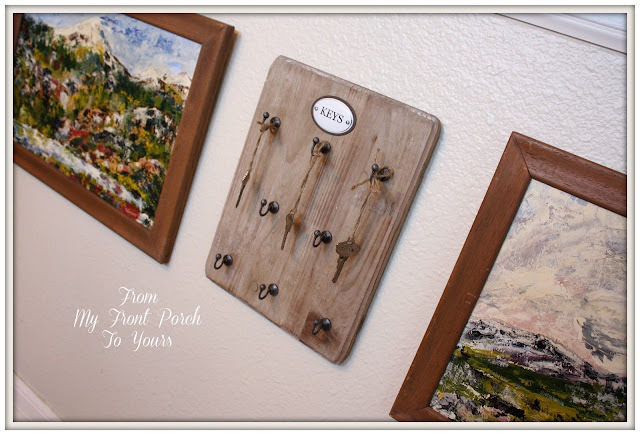 They truly add to the charm of the entire space and were very simple to make. No sewing involved! 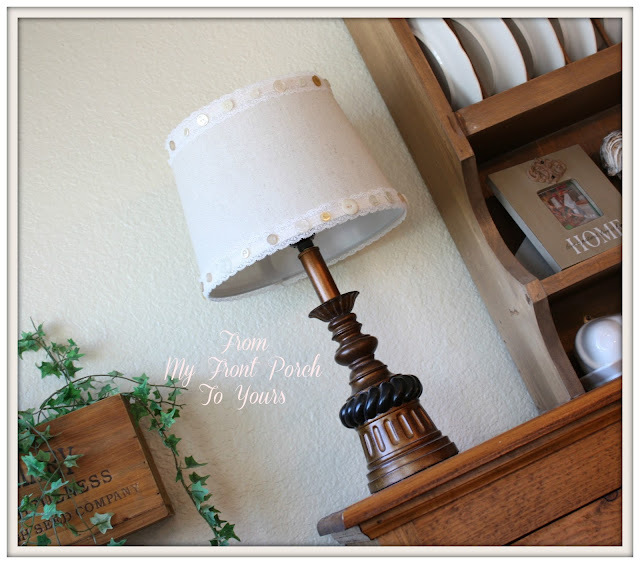 I want to thank Kimberly over at Serendipity Refined for inspiring me to make over my chandy! Cherished pieces like this pie safe my father in law made for us when we got married help make the space warm and inviting. The rolling pin was The Hubsters grandmothers. Another simple touch was to add some vintage lace and vintage buttons to this lampshade. 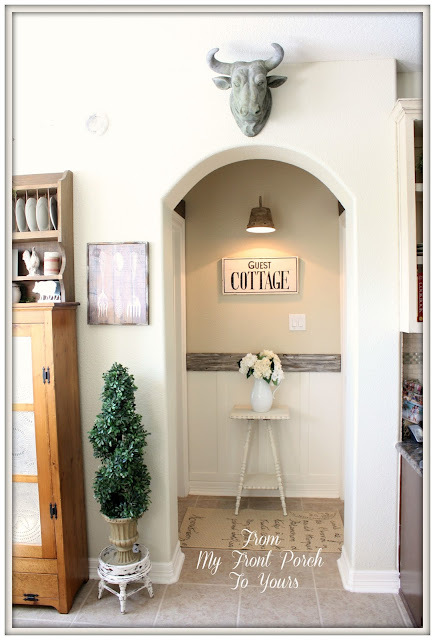 DIY wainscoting. 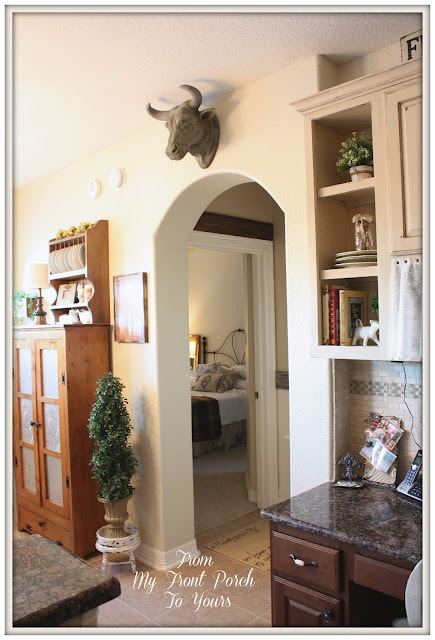 The bull head I purchased back in the spring from Antique Farmhouse. Where you can find me blogging! One day I would LOVE to rip out this built in desk area and replace it with a built in china hutch with some chicken wire but I do not see that happening anytime in the distant future so I did my best to make it look as appealing as possible. I added bead board wallpaper to the back of the cabinet to match the real bead board we used for our custom stove hood. 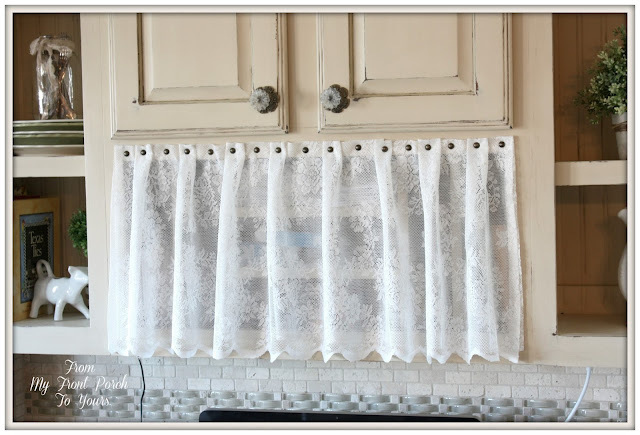 Lace curtain to help hide the everyday necessities. Yes, I know you can still see a little bit peeking thru but I did not want to put a heavier fabric on here. I think it would have weighed it down too much. I like the light and airy feeling the lace gives it. Vintage prints found at a local second hand shop. I had purchased one of them and left the other behind to only have my dear friend Brenda surprise me with it! I so glad she did because they are just perfect here. In a world with no money constraints The Hubster and I would love to just demo this section of counter out because it is just wasted space that collects clutter. We would prefer to have the area open and to have a longer island. Again though that will not be happening in this lifetime. House keys from our previous homes. This space is now a space we enjoy spending time in! Thank you for stopping by to visit. I hope that you have enjoyed the tour of our kitchen. 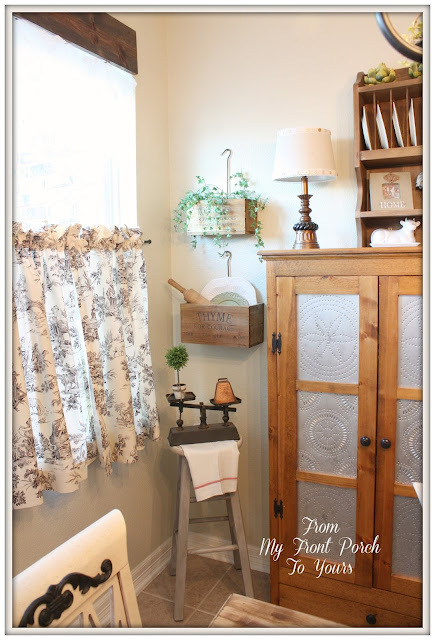 To see Part 1 of the kitchen reveal click here. Ohhhh it is so beautiful. You did such a great job on this kitchen redo. 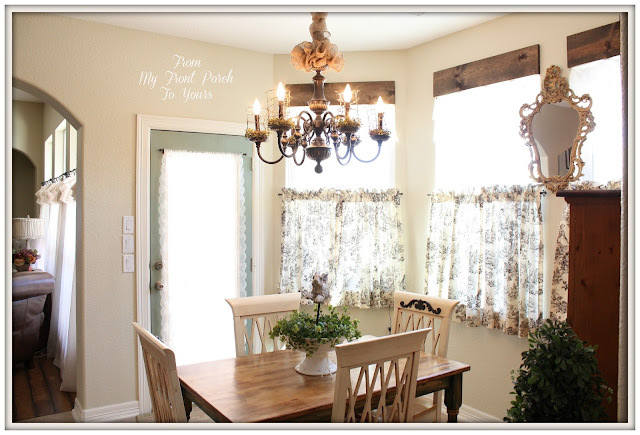 Love the new curtains in the breakfast nook. So bright and cheerful. I am going to go back over the pictures again. Just love this. I love the makeover, very pretty. I am also loving the chandelier. Beautiful job.! It looks wonderful. 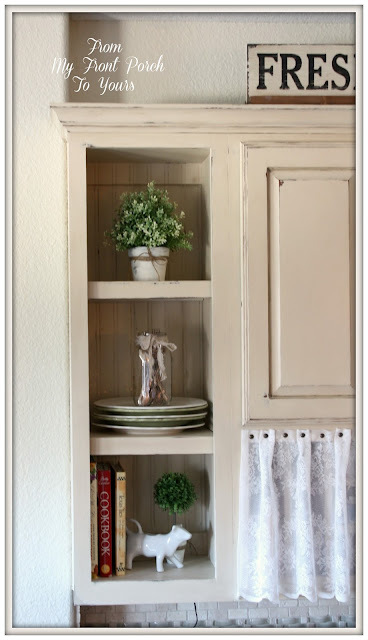 I love the lace curtain, hiding the shelves...perfect solution an so charming! What great changes, Pamela! 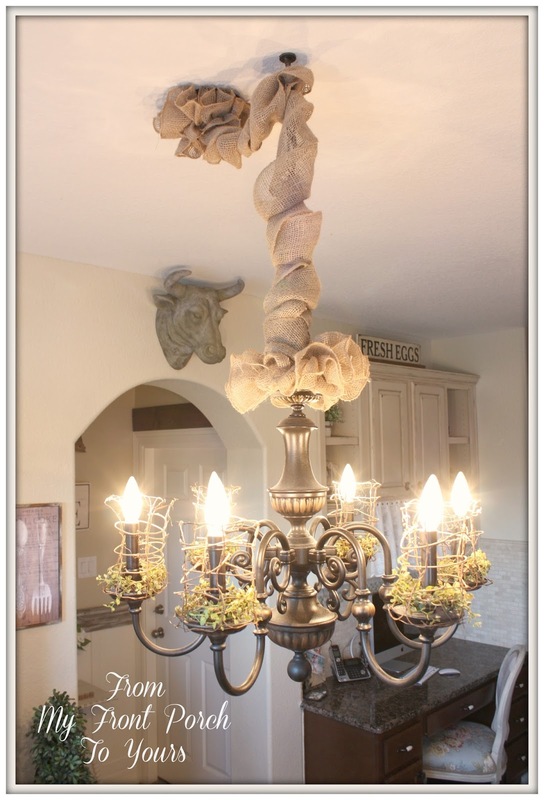 I love what you did to your chandelier. I was wondering if it was the same one and kept going back and forth between the two pictures. You make me want to do something with the one over our dining table now. I'd love to pretty it up. 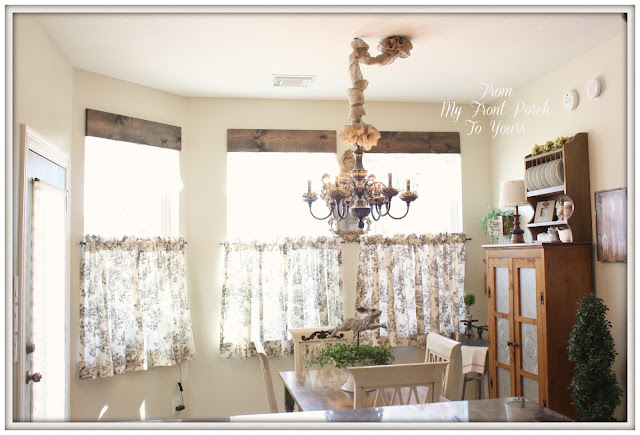 Love the window treatments, too. I really like the wood with the lace together ~ kind of a masculine/feminine thing. Great job and it really has lightened up the look. Your updated kitchen is lovely, Pamela. The lighter colours really helped to brighten the space. 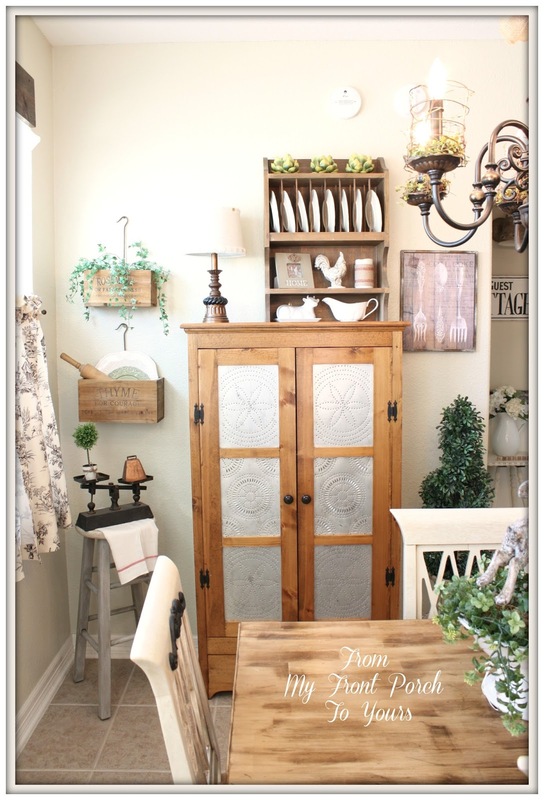 I especially like how you kept the wood desk with the light uppers as well as the little details like the bead board wallpaper inside the cabinets. Very pretty! I just love every inch of it. You've totally made it into a space that looks & feels so inviting. That pie safe is awesome!! Great job! The white cabinets make it! Great transformation! You never disappoint! Your attention to detail is fabulous! I love your range hood and the idea of removing the microwave! 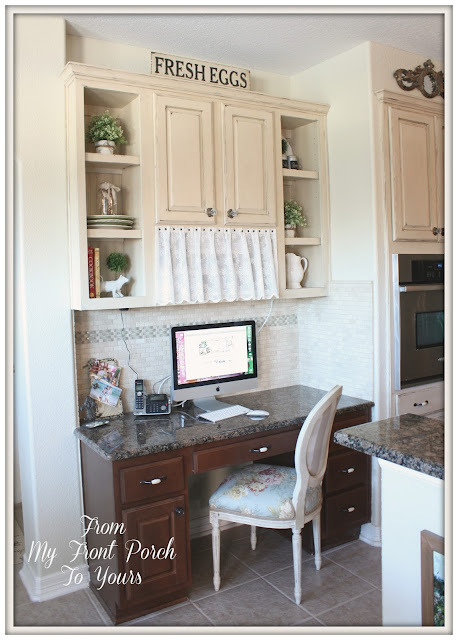 Your desk are is lovely- the lace curtain is such a clever idea! 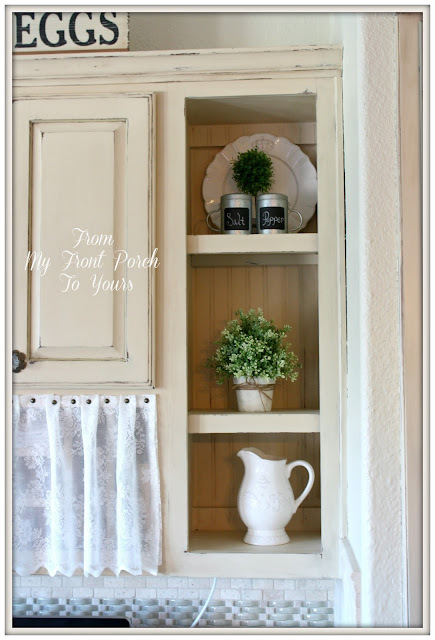 Your kitchen is so pretty! Oh my goodness where do I start! 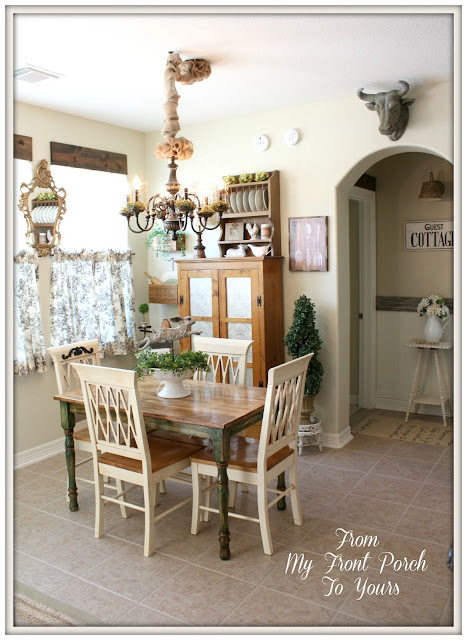 Love the new brighter color,love your chandelier transformation,love your lace skirt for your desk,love,love,love! You did a beautiful job Pamela! Love the color of the cabinets!! Suggested it to my sister, who has a dark kitchen. Just tried Annie Sloan paint for the first time today and can see why everybody LOVES it. 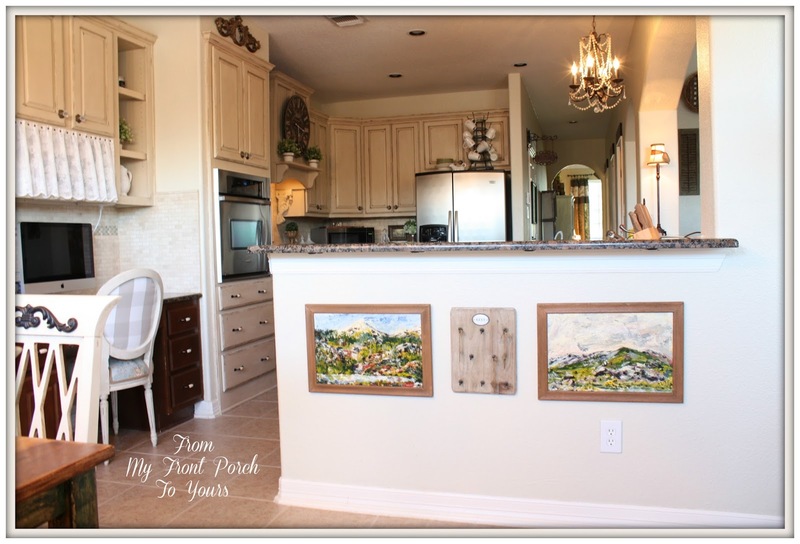 Beautiful kitchen, Pamela! Pamela, goodness you have been a busy lady! Every single detail is stunning and so refreshing. I can retail tell you have put so much thought into everythings function and yet so pleasing to the eyes! Funny thing is that my entire kitchen (cabinets, granite, backsplash) in our new home is Exactly like your before pics. It is a great open space though so I don't mind it as much. I would love to paint all my cabinets but they are only 2 years old. They are a light maple color. Would you paint them or wait a few years? Beautiful! I love the farm fresh feel of the kitchen. You did such a great job of adding just the right touches. And I'm proud of all of the hard work you put into it. I'm going to grab Tami and we're going to have to come see it in person. Beautiful job on the entire kitchen Pamela! Great job! Love your chair!! Nice marriage between the old ochre and the darker wood cabinets. Truly adds a "showcase" effect to the two rooms. Thank you for sharing. Oh my gosh! I am just drooling over your entire kitchen! I love every single aspect of it, and I had not seen it since you painted your upper cabinets. It's the details and the styling that make it so great. This needs to be in a magazine! What a fresh new look! 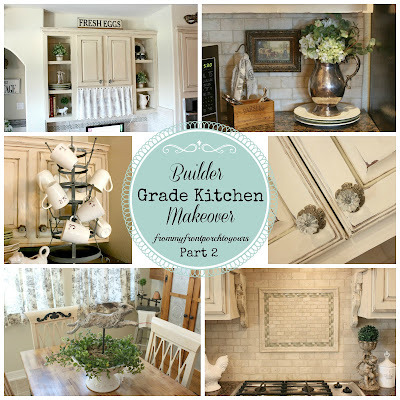 Love the lightened up cabinets and all of the French Country touches you've added. You've really done a great job giving it personality and making feel warm and welcoming. The cows are great! And just the right amount in my opinion...not overdone. Well done! 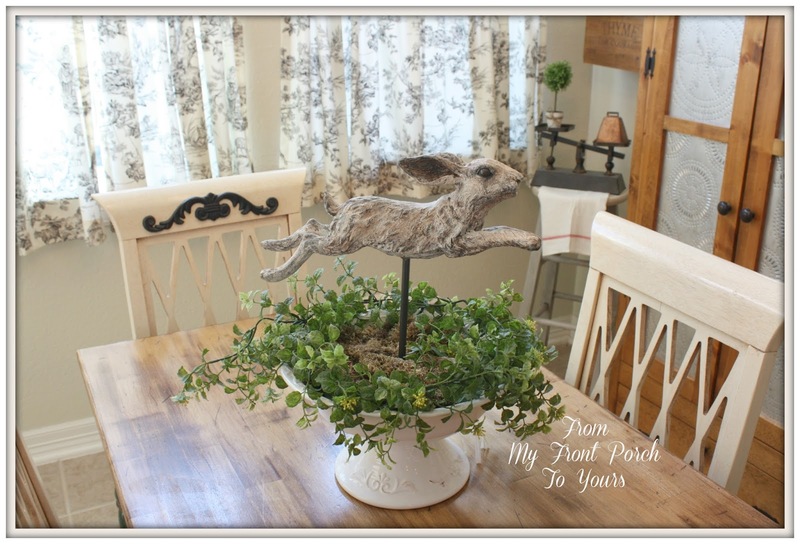 I have almost the exact same set up in my house - this is so cute! I would love to see a view from your living area into the kitchen to see how you handled the windows in the kitchen that can also be seen from the living area. If you stand in my living area you can see the set of windows in the living area and the ones in the breakfast nook area. They are only separated by a short wall and I am perplexed on how to handle the different window schemes. Pamela, I love the changes you made! 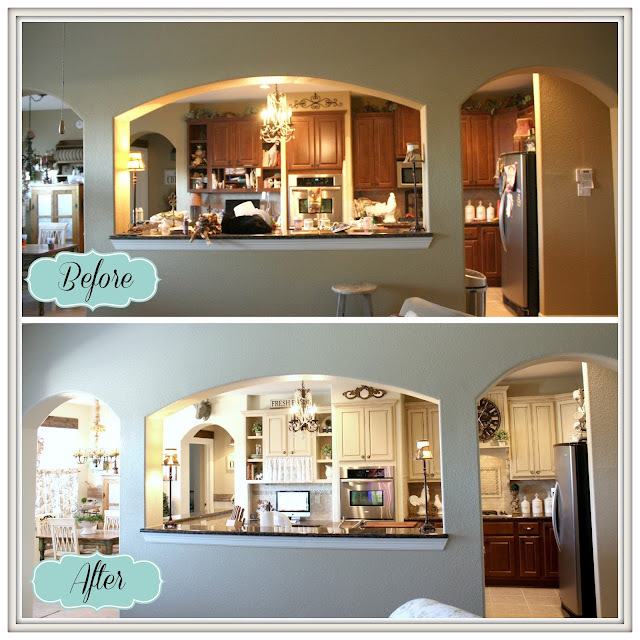 I bet your kitchen seems much bigger with the new paint color. You must be so happy with the gorgeous transformation as it is truly a beautiful labor of love....and it so shows! !...Just love seeing the many wonderful changes that you made....you have styled everything to perfection!! !...Love, love it Pamela!!! Lovin' the lighter look in have in there...darn cute FRESH EGGS sign! it is all just gorgeous! there isn't another word for it! all the little touches are wonderful! again I would have never ever thot it started out as builder grade it all looks so custom! The desk looks wonderful. 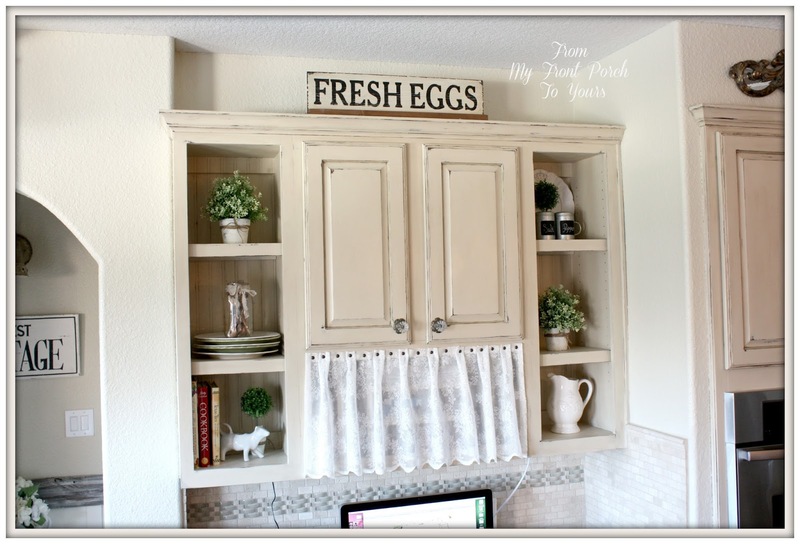 You have managed to make it look more like a hutch. Great job. Very nice! So much more relaxing with the lighter uppers. Everything looks so great. I went back to look at the kitchen reveal, too. I LOVE your tile. That made such a big difference, too. 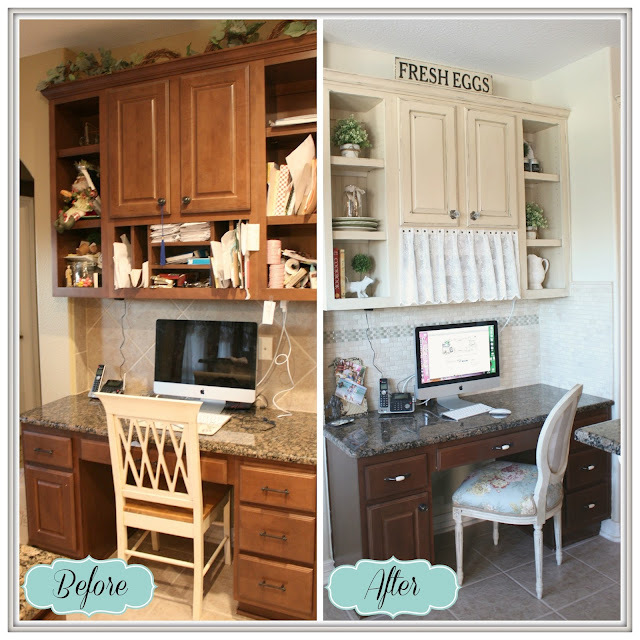 You've done such a great job transforming your kitchen and breakfast room! It looks so fresh and pretty. This is so fantastic! Every inch was so carefully thought out! You are an inspiration to us all! I tried to do this without the clear wax. We use our kitchen ALOT and really need a heavy duty sealer. Well by skipping the clear wax when trying to apply the dark wax to edges it makes the cabinets look dirty. Any advice? I found your kitchen via Pinterest. I love how you transformed it! My kitchen is similar to your original kitchen - dark cabinets, dark granite with the same dark granite as a back splash, plus all the appliances are covered in the same wood as the cabinets. Light tile floors. I would love to transform it into a Farmhouse kitchen....in this lifetime! If I had a magic wand.... Thanks for sharing. You have inspired me! It CAN be done on a budget! Your kitchen really looks amazing! 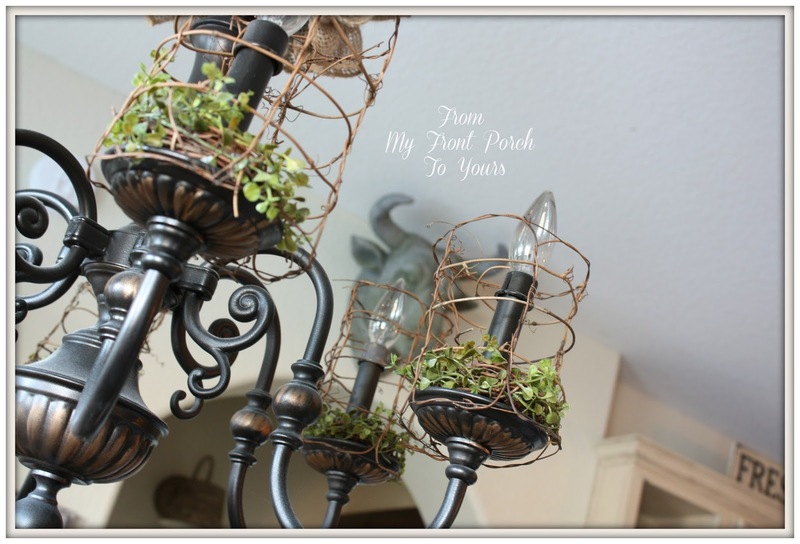 Definitely one of the best DIY projects I’ve ever seen! I would love to make over my cabinets but they’re not real wood. They’re something called Formica. Idk exactly what they’re made of, but the outside finish is absolutely the most disgusting thing ever...shiny bright white almost plastic looking material...so cold and uninviting. I actually hate walking into my own kitchen nvm actually spending time in there cooking or otherwise. Unfortunately I can’t afford a reno so if you have any ideas for transforming something like what I’m dealing with...please let me know. Again, great job in kitchen...looks awesome!